In honor of National Pi day, we're celebrating the Raspberry Pi, which was created by the Raspberry Pi Foundation as a way to make computers more accessible to people all over the world. The Foundation provides low-cost, high-performance computers so more people are "capable of understanding and shaping our increasingly digital world, able to solve the problems that matter to them, and equipped for the jobs of the future," (Source: www.raspberrypi.org/about/). Contemporary Controls strongly supports the vision of using open hardware and software to make technology more accessible to everyone. As part of our vision for open control, we've created the BASpi I/O board for Raspberry Pi, which turns your Raspberry Pi into a BACnet-networked, Sedona-programmable controller with 6 Universal Inputs and 6 Relay Outputs. We chose the Raspberry Pi because it is a powerful embedded platform, it is easily accessible, and it is the micro PC with the largest community which provides support in the form of custom applications, software tricks and neat "hacks". Given that the community already has a lot of diverse applications for the Raspberry Pi, we wanted our expansion board to offer some new capabilities. Our BASpi hat provides enhanced hardware circuitry, web-based configuration, and free graphical programming software for control applications. We wanted to truly enhance the capabilities of the Raspberry Pi3. We also wanted to keep both the hardware and software open, so we designed our BASpi hat so it can be run in conjunction with other applications on the Raspberry Pi. 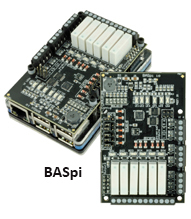 We've created two versions of the BASpi. One is just our BASpi I/O board for those people who already have a Raspberry Pi and are experienced with programming it. The other is the entire system, which includes the Raspberry Pi 3 board, our BASpi I/O board, an industrial grade μSD card with pre-written image, international power supply, and an enclosure case. Learn more on the BASpi product page. And if you haven't already done so, be sure to read our interview about the BASpi in the latest issue of AutomatedBuildings.com.